Chances are if you have stumbled across this post, you want your blog to be a source of inspiration and information for your readers to draw the crowds. Blogging is a lot like dancing. It requires you to have rhythm to your writing, an elegance that draws people in and has strong meaning behind it. Most importantly, it is best to practice and play around behind closed doors before you show off your skills. We have compiled 5 tips to take your blogging from ‘two left feet’ to ‘mesmerizing’. We have all seen the rise of ‘click bait’ headlines in mainstream media. Shocking, surprising headlines draws readers. How you headline your blog goes a long way towards determining whether people will take the next step and read what you have to say. When it comes to creating fantastic blog titles try to be memorable, creative and informative. Think of your title similar to a dancer choosing a costume. Make it stand out and people will be drawn in to your performance. A little bit of research can really help draw in the crowds. Take time to research what blogging content is already drawing traffic in your industry. Understand the type of content your target audience is consuming, stamp your own mark on the topic and take your blog a little deeper. People love to read content that is insightful and resonates with them. You will not get there by just skimming on the surface with your blogging. Learn to connect with your audience, influence how they feel. If you were a dancer it would be like putting your own signature on the most popular dance in vogue. 3. Does your blog add usefulness to people’s lives? This is overlooked as bloggers focus too much on the end game. Try and add value to people’s lives with your blogging. Understand that your content needs to relate to your audience. If your writing provides tips to save people time, money and resources or is a source of motivation and inspiration then you are on the correct path. A courageous dancer stimulates their audience, as does a fantastic writer. Will you inspire your readers to act? This is a simple and effective tip. Have visible calls to action on your blog that make it easy for your readers to share across various social media platforms. Your readers prefer simplicity. Can your audience share your blog with a click of a button instead of having to copy and paste links? To become a great blogger in a congested industry think how you can stand out from the crowd. Is your writing polarizing? Or does it have a quirky and unique style? Play on your strengths and make them your point of difference. It is what sets you apart from others that will attract readers, not what makes you the same. Carve out your own writing style and create your own path. You can still use popular content and make it your own. Much like an awe-inspiring dancer, they don’t move like the rest! 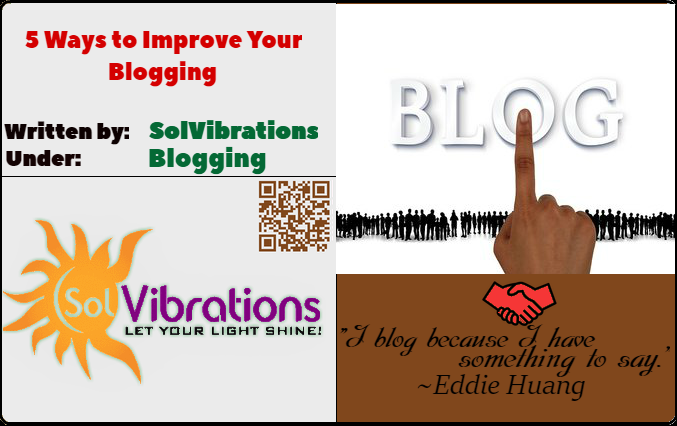 5 Ways to Improve Your Blogging has been endorsed by SolVibrations. Do you need Dissertation help? click here. Thanks for this informative content…. i like the first point and that is the most important aspect of developing your content. having a great headline is what will get the 20% of users who click headlines not to ignore yours. It is important that one learns all the tricks that are used to optimize headlines.